The last one is my favourite really, since it’s just two guys talking about cycling, and using the map for what it’s meant for. 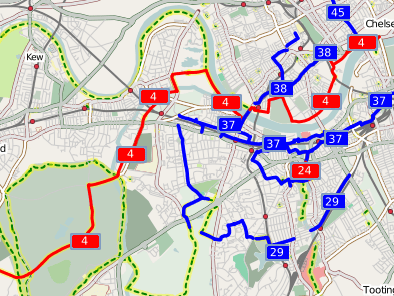 I’ll need to head over to Battersea and extend route 37 onwards… Hopefully more and more people will find it genuinely useful as well as just cool. Oh, and of course, the cycle map made the featured image on the front page of the OSM wiki for the week beginning 11th August. Nice. And to think when I commented only two months ago “roll on a cycle-focussed version of OpenStreetMap!” that I had no idea I’d be the one making it happen! This entry was posted in Uncategorized and tagged OpenStreetMap on August 30, 2007 by Andy. Well done on a great map, its good to see that people outside of the OSM community are using it. I’m still battling with the illogical routes in Sutton, attempting to extend and improve on them each week. Cheers Thomas. Logic is certainly not something that’s been applied to many of the cycle routes – and it takes a while to get my head around their non-linear nature (but drawing them out into the db certainly helps!). I keep finding signs pointing in three or four directions with the same route number, and it’s hard to tell whether the route is genuinely forked, or whether one of the signs is just pointing down an un-numbered link route and only has the number on it because they were all made at the same time. The worst I’ve found is the Wandle Trail / LCN 24 / NCN 22, where the signing is barely existent and continually contradictory with the reference numbers. All in all, Sutton is a bit of a challenge! The map is now Google’s eighth result for ‘National Cycle Network map’… and given that 1,2,4,5,6 and 7 are all Sustrans pages, I reckon that’s pretty good.